The search is finally over. You can now safely throw away your deep fat fryers, oil thermometers and vats of vegetable oil because you won’t be needing them any longer! Behold the glory of the perfect chip AND it’s made in the oven! 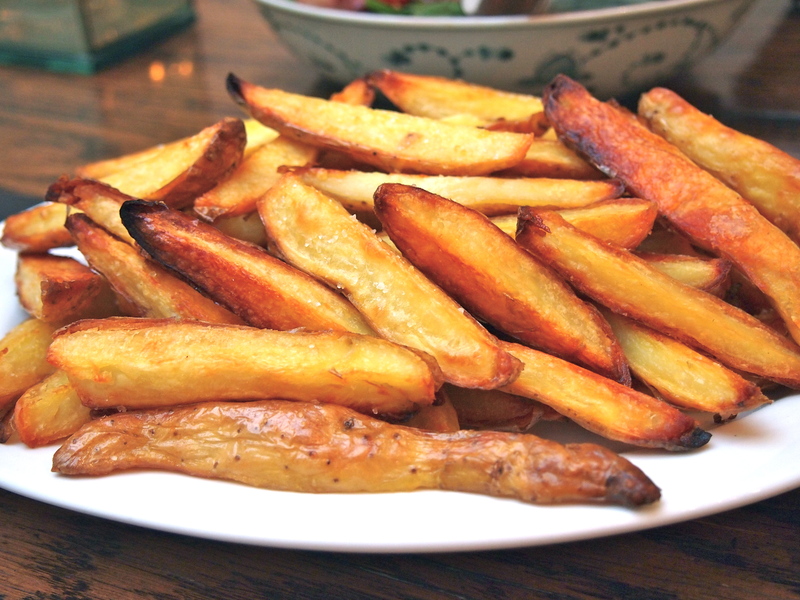 Now lets face it who doesn’t like hot chips – crispy exterior, fluffy potato interior, glisteningly crunchy and made all the better with a little smattering of sea salt. But until now the only way to get to this potato nirvana was by the tiresome, messy and sometimes dangerous method of deep-frying – and according to the likes of Mr Blumenthal, up to 3 times! Sure there have been some good, even great, oven chips like these but this oven chip surpasses them all. The thing that makes these chips stand out is the way they are pre-cooked before being roasted in the oven. I’ve tried a number of methods with varying degrees of success. 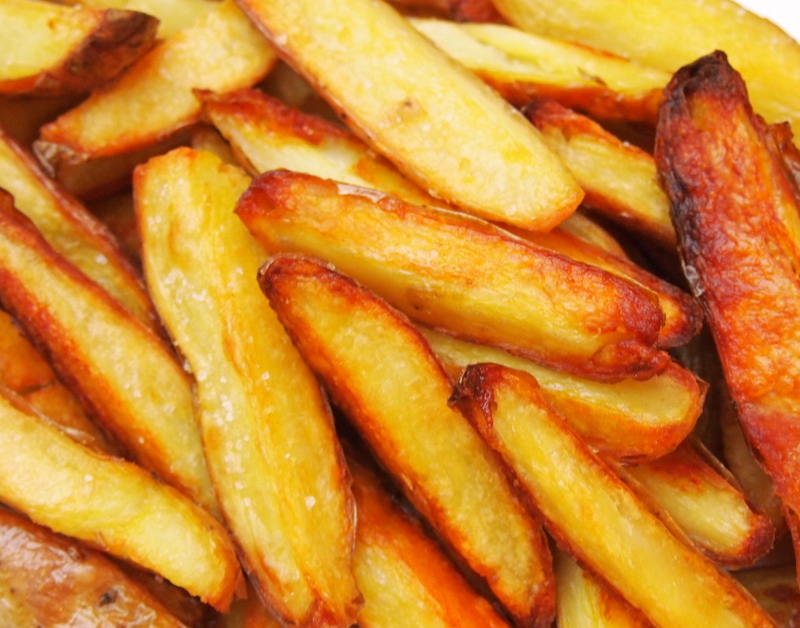 Originally I would cut the potatoes into chips and then parboil them but I’d often find the chips had absorbed too much water and wouldn’t get crispy enough when they were roasted. To eliminate this I then started boiling the potatoes whole and then cutting them into chips – much better. But in this recipe the potatoes are oven baked on a bed of sea salt which completely devoids them of any moisture resulting in ultra crispy chips. I can’t unfortunately take credit for the recipe, that belongs to Karen Martini who published it in her book Cooking At Home. The recipe however is at the beginning of the book under nibbles and she serves them with a tahini dipping sauce. I’m sure it’s because of the placement in the book that these have gone under the radar as the perfect way of oven roasting chips. So I will take credit for bringing them to your attention. You can thank me later! Preheat oven to 220C. 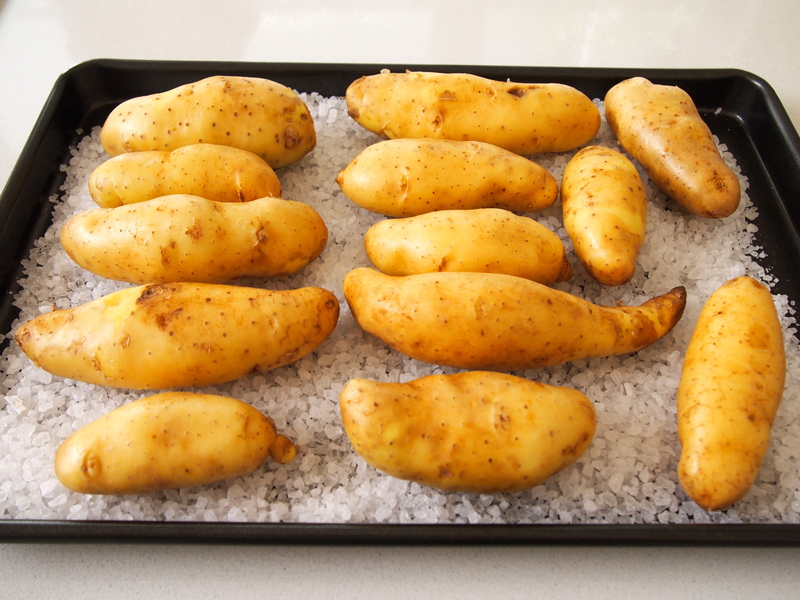 Spread the rock salt on a baking tray that is large enough to hold the potatoes in one layer. Wash the potatoes well and dry them thoroughly. Prick each potato 2-3 times with a fork and place on the rock salt. Bake for 40 minutes or until the potatoes are tender – timing will depend on the size of your potatoes so start checking after 30 minutes. Remove the potatoes from the oven and when cool enough to handle cut the potatoes into chips. 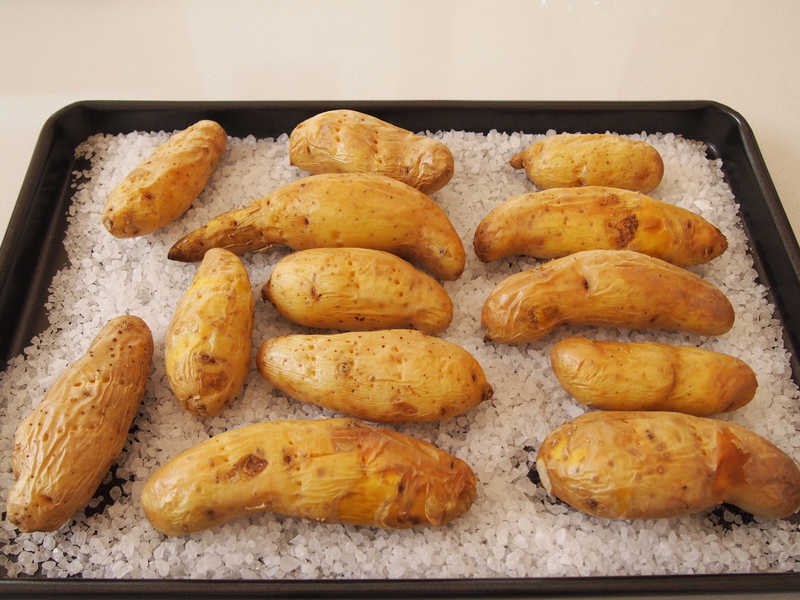 The potatoes can be prepared up to this stage ahead of time and left at room temperature. 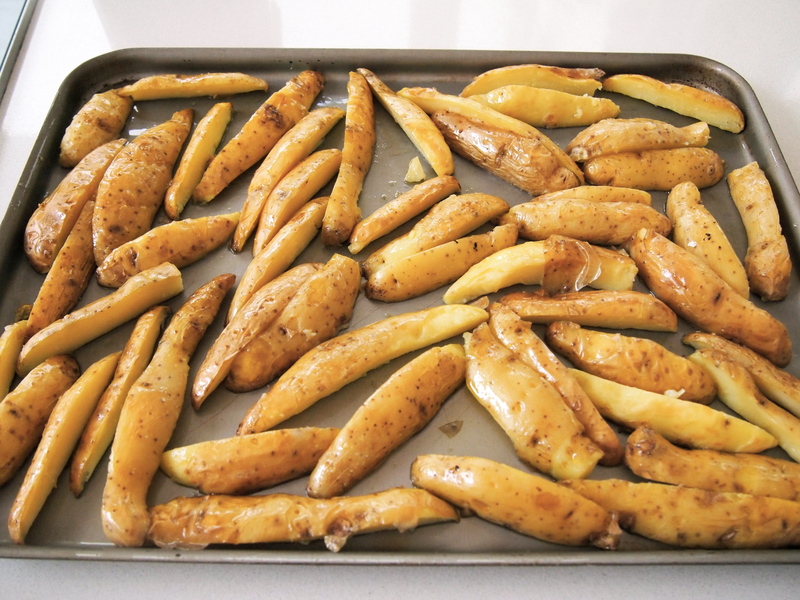 When you’re ready to roast them heat the oven to 200C and place the potatoes in a single layer on a shallow sided baking tray and drizzle generously with enough oil to lightly coat the chips. Season with salt and roast for 40 minutes or until golden and crispy. Half way through the cooking time check them and if they can be easily lifted off with a spatula give them a toss around. If they can’t be lifted off easily check again every 5 minutes until they can and then give them a toss. When ready, remove to a serving platter and sprinkle with a little more sea salt and serve straight away.